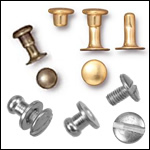 A collection of leather screws, components, and decorative leather rivets. 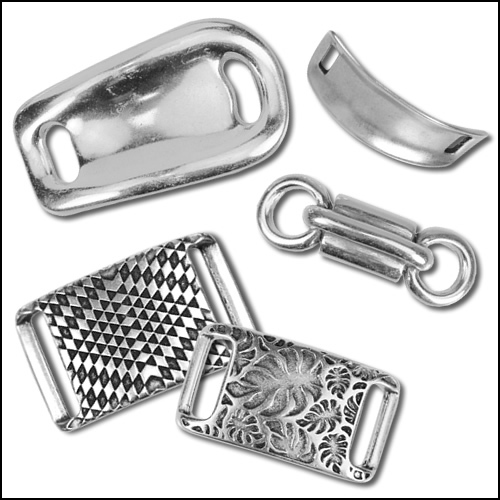 The antique silver bracelet bars are sold per 10 pieces and available in many styles. Some bars require glue to attach to leather, while others require rivets, screws, or stopper bars to make a leather bracelet. They look great as leather bracelet centerpieces! 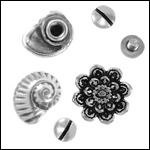 The leather screw sets are sold per 10 pieces and available in antique silver and many styles. Use to instantly spice up a flat leather bracelet, leather bag, or for other leather crafts. To use, simply punch a hole in leather and screw in embellishment. You can use a small screwdriver to tighten and secure the screws to leather.